Mobile phones can now be recharged while riding a bike. 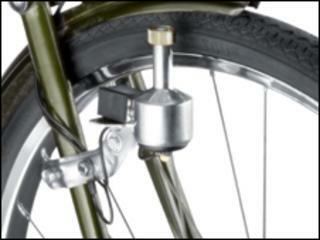 Phone firm Nokia has released a charging kit that uses a dynamo powered by a bicycle's wheels. Any cyclist wanting to re-charge their handset using the kit will need to maintain a speed of about 4mph (6km/h), said Nokia. The charging kit is intended for nations where bicycles are ubiquitous but will work with any phone using a 2mm charger jack. "Bicycles are the most widespread means of transport in many markets around the world, so this is just one more benefit to be gained from an activity people are already doing," said Alex Lambeek, Nokia vice president in a statement. Nokia said charging times will vary by speed but a cyclist completing a 10 minute journey at 6mph (10 km/h) will produce enough power for 28 minutes of talk time or 37 hours of standby time. Also included in the kit with the dynamo is a holder to secure a phone to a bicycle while it is being re-charged. Nokia said the charging kit will be available through its stores worldwide by the end of 2010. Prices will vary by market. In Kenya, where the kit was first unveiled, it will cost about £12.50 (15 euros). When it unveiled the charger, Nokia also showed off four phones designed for developing nations. The handsets are made for places where the electricity supply is limited and have a six-week standby time. Nokia is not the first firm to produce a dynamo charger. Similar devices from firms such as Pedal & Power have been widely available for some time.